Over three decades, Clean Break has proved invaluable as a pathway to rebuilding new lives for women affected by or caught up in the criminal justice system. Set up by two former female prisoners, it’s provided rehabilitation opportunities as well as a platform for new writing by a swathe of women writers, amongst them Zawe Ashton, Lin Coghlan, Vivienne Franzmann, Tanika Gupta, Sam Holcroft, Lucy Kirkwood, Rebecca Prichard and many more. Somalia Seaton and Chino Odimba are just the latest recruits to come from Clean Break’s Emerging Artists programme. Not an easy double-bill from two young writers with undoubted potential, it nonetheless confirms Clean Break’s refusal to stand still and determination to constantly break new ground. Focussing on ethnic and minority groups, Somalia Seaton’s House and Chino Odimba’s Amongst the Reeds take us into some very taboo areas – young, foreign, homeless seeking `Leave to Remain’ and hidden sexual abuses – that nonetheless carry messages of hope and optimism. Of the two, House is the more accessible if slightly more shocking – a tale of religious denial and hypocrisy as Patricia, (the excellent, upbeat Shvorne Marks), recently out of prison, returns to her Nigerian, deeply religious mother (a commanding Michelle Greenidge) still refusing to acknowledge the church’s part and her own in Patricia’s troubles. 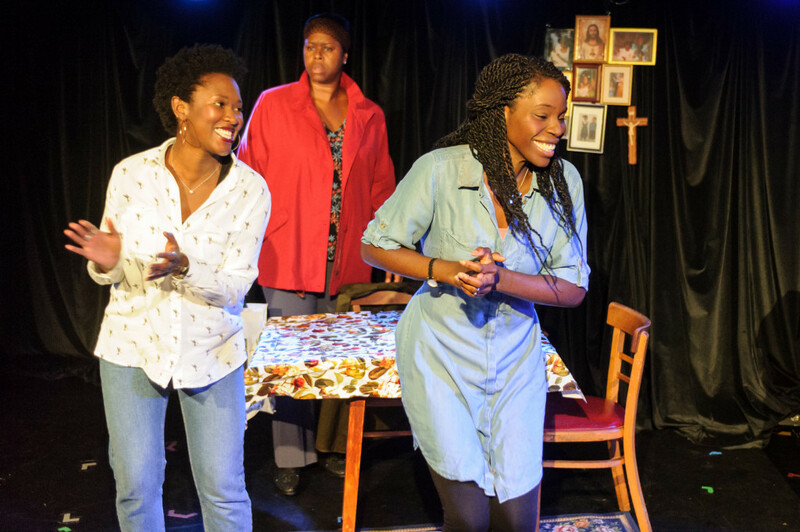 © Jane Hobson, Rebecca Omogbehin (Jemima), Shvorne Marks (Patricia), Michelle Greenidge (Mum). Seaton writes with an edgy kind of naturalism and concluding rapping poetry which makes one wish she might have utilised that more. By contrast Chino Odimba’s Amongst the Reeds’s highly stylised, almost surreal account of young Nigerian Oni and Jan Le’s pregnant Vietnamese teenager, Gillian, might have greatly benefitted from a little more realism in relating a friendship born of desperation, fear and uncertainty. 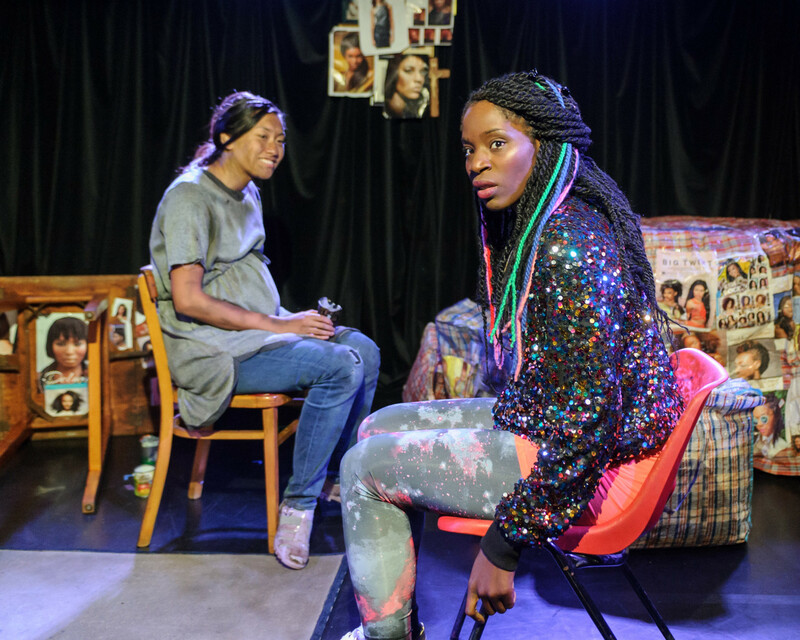 Odimba certainly captures the paranoia – and the street camaraderie – of young asylum seekers in Róisín McBrinn’s sparky production but such is its style, she also keeps us guessing as to its exact nature and provenance. Is Rebecca Omogbehin’s Oni a real person or a figment of Gillian’s imagination conjured as a support in her appalling situation, again resulting from sexual abuse. 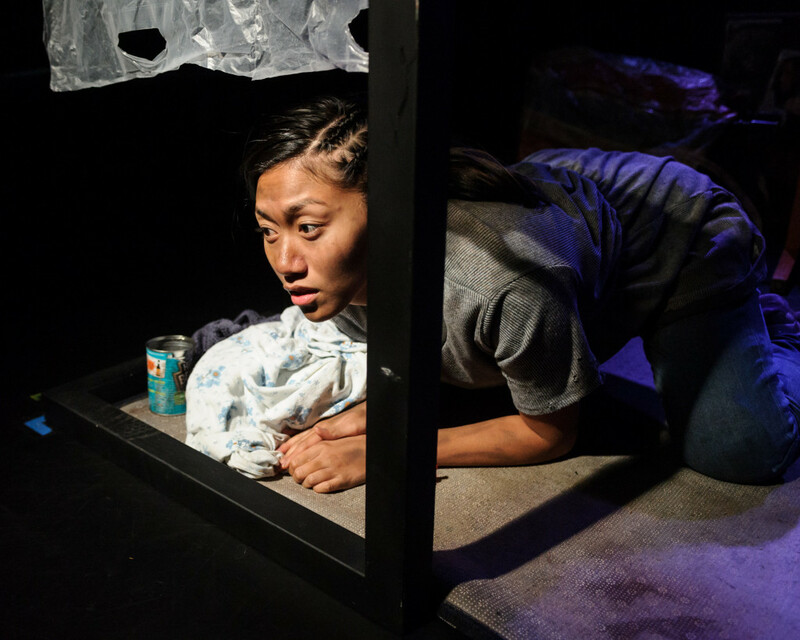 Hard-hitting, vital plays both, powerfully performed, of marginalised lives normally safely tucked away from public view, a little more polish and they’d have been resounding triumphs. 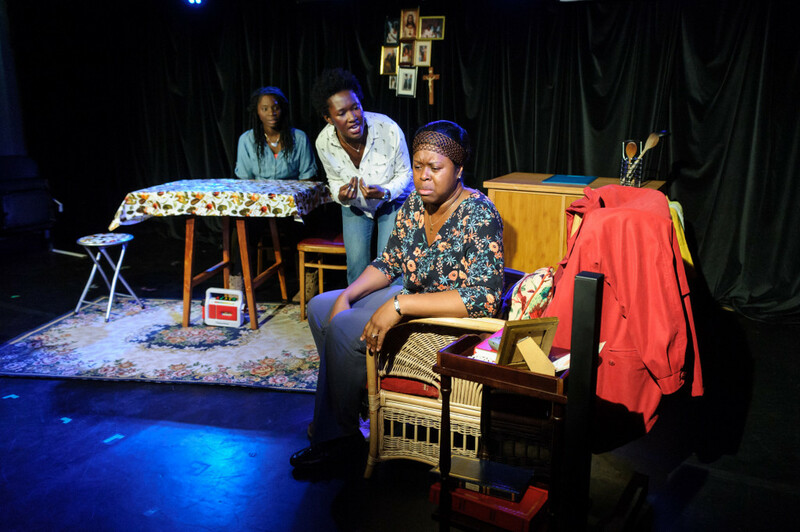 © Jane Hobson, Shvorne Marks (Patricia), Michelle Greenidge (Mum), Rebecca Omogbehin (Jemima). Still worth the trip to Hackney Wick. Review first published in Reviewsgate, Sept 2016 and slightly amended here. Clean Break’s double-bill of House & Amongst the Reeds runs at The Yard to Sept 17, 2016.